Optimize the onsite search experience with our top tips. Optimising your search strategy and configuration should be part of your regular site review. There is plenty of helpful advice out there on how best to go about this, but it can often overlook some of the fundamental issues we are regularly asked about. This new blog series aims to provide online retailers with the practical advice they are after. Ultimately, getting the search experience right is as much about applying good sense and sound judgment as it is algorithms. Online retailers need to take a lesson from traditional brick-and-mortar stores. There, shoppers have the exact same requirements - and sometimes very similar challenges. Yet, when we ask store assistants questions in offline environments we are unlikely to encounter the problem of misunderstandings that can upset online shoppers. That's because we always have the option to clarify what we mean and ask follow-up questions. Should we always push search? When we talk to clients about optimising onsite search, their biggest concern is to make sure the results are relevant. However, optimising relevance is only half the answer. An international multichannel retailer asked us to help them improve the quality of their search function as it hadn't been given much attention, and poor search results showed this was the case. We were invited to discuss progress with one of the directors. We had made some terrific improvements, so felt very confident going into the meeting. 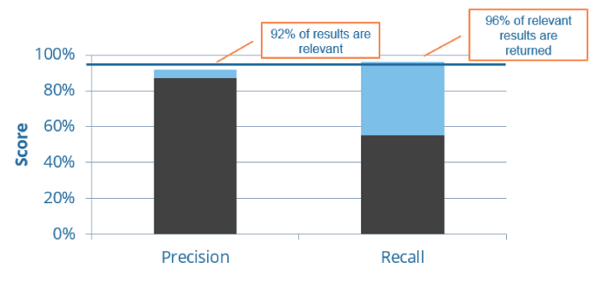 We presented the graph below, which illustrates how we had improved the two most frequently used evaluation metrics for search systems - precision and recall. Precision is a measure for the relevance of the products that have been found and recall measures if the search system has returned all results. Search results had significantly improved, and this translated to millions of pounds in incremental annual profits. Surprisingly, the director was not nearly as excited as expected despite these substantial improvements. He pointed out issues with results for odd search terms. These searches had changed his view on search quality, even though they only appeared a few times a month, and more often than not the retailer did not sell any matching products. Here, as so often in onsite search optimisation, perception had trumped hard facts. Often poor search experience is not caused by algorithmic problems, but stems from a mismatch between the expectations a shopper has about how the results should look and what the search engine returns. If retailers want to avoid this mismatch, they have two options. We can try to ensure the mismatch never happens by further increasing precision and recall numbers. However, there are limits to this. There will always be searches for products you don't sell or searches with so little contextual information that returning results becomes pure guesswork. The other option is to work on customer expectations and the perception of search results. In many cases, the only reason shoppers (and retailers) are unhappy with search is because they simply can't understand why certain products are being shown. This option tends to be much more cost-effective. This is an area we will be examining in Part 3 of our blog series when we discuss helping customers express what they want. Next week, in Part 2, we ask whether retailers should always push search.